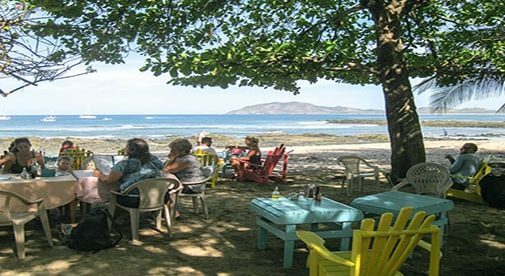 The Costa Rican town of Tamarindo is an inspiring location for writers in search of a laidback retreat. When I moved from the U.S. to Costa Rica in 2013, it was easy to walk away from my stressful corporate sales job. To fund my new life, I turned my focus instead to my writing career. I love having the type of job I can do at any age, from anywhere in the world. However, there are elements of office life that I miss. For instance, there is no proverbial water cooler to interact with co-workers, no manager down the hall to bounce ideas off, and no work-related social events. Therefore, as a 2019 goal, to make up for the social deficit of working for myself, I decided to form a writers’ group. Writers often need to brainstorm, share a little support, and have a second set of eyes to help with edits. Fortunately, there are several writers in the expat community on the Gold Coast of Guanacaste, Costa Rica. And, once I’d gathered them together, what I discovered was a group of incredibly talented women from different backgrounds who have found a way to earn money in a foreign country by using their writing talents. For example, Nicole Rangel, now 43, moved to Costa Rica in September 2017 from Dallas, Texas along with her husband and their two young children. “It was important to find a country that was safe for our family, had quality drinking water, and bilingual education that was close to our home country’s education system,” says Nicole. CC Sullivan is a 55-year-old graphic artist and indie author from Toronto, Canada. Six years ago, she and her husband, Michael, came to Tamarindo for a vacation and bought a townhome. “Michael’s dream was to eventually move to a warm climate. He’d been here before and loved it. We rented our townhouse to visitors during high season and came often.” A year ago, they moved full-time, but still travel to Canada to see their children and grandchildren. Rachel White is a 43-year-old mother of four, who for the last 10 years was a stay-at-home-mom and a part-time freelance writer. “We took a vacation to Costa Rica six years ago, and it was love at first sight. We spent the next four years figuring out how to make the move from Michigan and transitioning my husband’s business to a self-sustaining model, so he could work remotely,” she says. “We chose Tamarindo because it’s on the ocean—my husband loves to surf and I love the water—and has a huge variety of nearby schools.